Because then I can forgive this young man his overly short sleeves, his criminal misuse of polka dots, his friends who obviously think there's no problem combining polka dots with madras shorts, and--most bizarre of all--his stepping out in public with a geisha-like soupcon of white lipstick on the center of his "I'm just the model, people!" mouth. 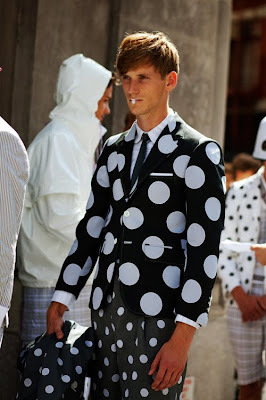 The only thing good about this train wreck is the polka-dot bag in his right hand.